A map of the proposed starter light rail from East Riverside to Highland. What about the roads part of this? So if I vote for this proposition and it passes, we're approving spending for these road projects? Not really. The spending on road projects is a precondition for construction of the starter light rail line, but technically you're not approving (or disapproving) the $400 million in road spending by voting on the proposition. The next city council could theoretically do these road improvements with or without the passage of this proposition, because they're not actually voter-approved bonds. Voters are in essence being asked to decide on a light rail line that will only be built if road improvements accompany it, not to approve spending on both rail and roads. What Will This Light Rail Do for Traffic? What will this do to my property taxes? And what exactly does this money pay for? Your property taxes will go up. For a home currently worth $200,000, the anticipated property tax increase works out to about $220 a year, for twenty years, for a total of $4,400. I noticed you keep saying 'Rail and Roads Proposition' but I thought it was called 'Prop 1'? I also noticed you keep saying 'Light Rail.' But I keep hearing city leaders and project planners using the term 'Urban Rail.' What's the difference? If this proposal fails, is there a 'Plan B'? Where is the rail and roads proposition on the ballot? 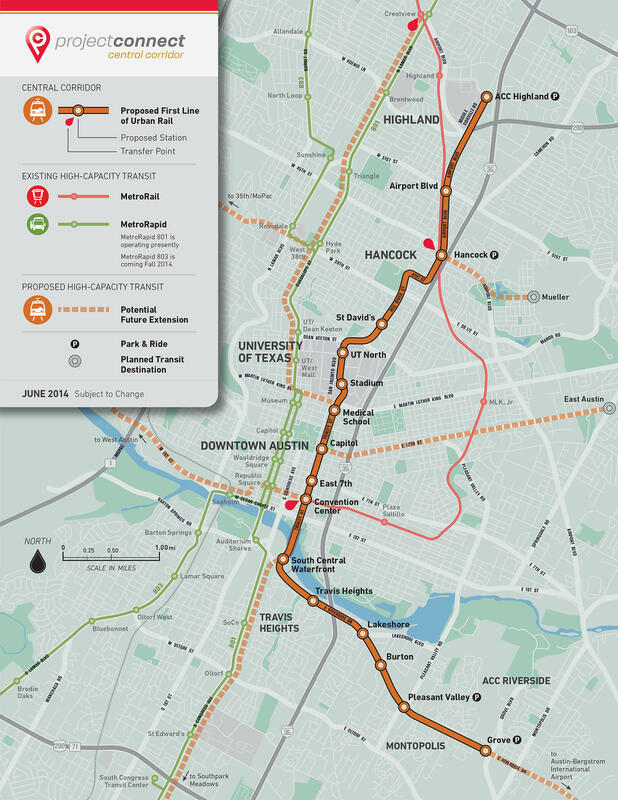 "The issuance of $600,000,000 bonds and notes for rail systems, facilities and infrastructure, including a fixed rail transit system to be operated by Capital Metropolitan Transportation Authority (which may spend its funds to build, operate and maintain such system) servicing the East Riverside Corridor, downtown Austin, the State Capitol complex, the Medical School complex, the University of Texas, Hancock Center, Austin Community College Highland campus, and surrounding neighborhoods, and roadway improvements related to such rail systems, facilities and infrastructure; provided that the City may not issue bonds or notes to pay costs of the fixed rail transit system (other than expenditures for planning, designing and engineering necessary to obtain grant and/or match funding) unless (i) the City obtains grant or match funding for the cost of the fixed rail transit system from the Federal Transit Administration or one or more other federal or state sources and (ii) the City provides funding in an amount not less than $400,000,000 to pay costs of roadway improvement projects of regional significance that are designed to relieve congestion, enhance mobility and manage traffic in the I-35, US 183, SH 71, RM 620, RM 1826, RM 2222, FM 734 (Parmer), Lamar Boulevard, and Loop 360 corridors; and the levy of a tax sufficient to pay for the bonds and notes." If the rail and roads proposition passes, will the light rail line definitely be built? There are two conditions included in the ballot language that must be met before construction can begin on the East Riverside-to-Highland light rail line. One is that the project must get matching federal funds of $600 million from the Federal Transit Authority's New Starts Program, which pitches in for transit projects throughout the country. There are dozens of other projects in line for that limited pool of money, and it would be a few years before the Austin project would apply and get an answer. Federal matching funds aren't guaranteed. The other condition is the one we mentioned earlier, where $400 million in state road improvements must be funded before construction on the light rail line begins. If the proposition does pass, could the route of the light rail line be changed? That depends on who you ask. One of the leading candidates for mayor, Steve Adler, has said that he thinks the proposition is "an authorization, not a mandate, and the next council will have the ability to revisit decisions this council is now making." But the ballot language is pretty clear that if the rail line funding is approved, the line must serve the East Riverside to Highland route. One last question. Where do I vote? A list of Travis County polling places is available here, and there's also some app options to guide you, too, like The Voting App. You will need a photo ID to vote this year because of Texas' Voter ID law.